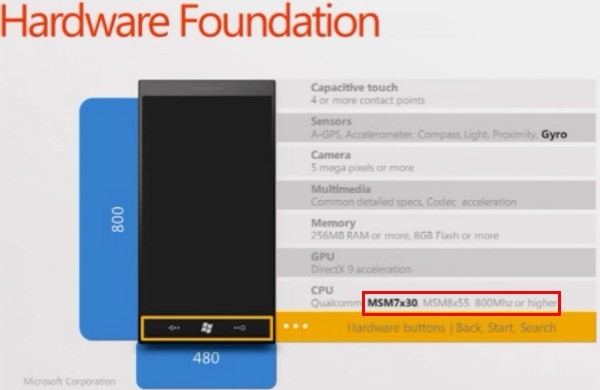 At Mix 11 today, Microsoft revealed the new chassis specs for Windows Phone 7 devices. The minimum chassis specs have been updated to require at least a 1GHZ Qualcomm MSM8x55, or the Qualcomm MSM7x30. Both of these processors have more powerful Adreno 205 graphics. There was however no mention of the HVGA chassis that had been previously mentioned. Finally, a Gyro is also required for future devices. These spec bumps are great but many phone fanatics are still waiting to hear when dual-core processors and front-facing cameras will hit Windows Phone. Perhaps we'll hear more this summer before Mango is released. The gyro is not mandatory. It's optional for OEMs to add. Phones that lack a gyro will automatically use the accelerometer and compass to simulate one, causing them to remain compatible but just have lesser accuracy.